Inspired by the clinically approved albumin based PTX formulation (Abraxane) and high-drug-loading dimeric prodrug tactics, herein we report a theranostic “Abraxane-like” prodrug formulation, which is comprised of human serum albumin (HSA), a paclitaxel (PTX) dimer bridged with thioether liner (PTX2-S), and photosensitizer IR780 iodide. Nanoparticles (NPs) with PTX2-S and IR780 as the core and HSA as the stealth shell are formed. Compared with HSA-based PTX clinical formulation (Abraxane), the dimeric molecules not only constitute the bulk structure of the particles, but also act as crossing agent, thus realizing drug loading content increasing from 6.6 wt.% to 48.7 wt.% with high loading efficiency (> 90%) and excellent stability in biological conditions. Importantly, the thioether linkage dually responds to the tumor redox heterogeneity and the NPs gradually releases the parent drug PTX for chemotherapy. 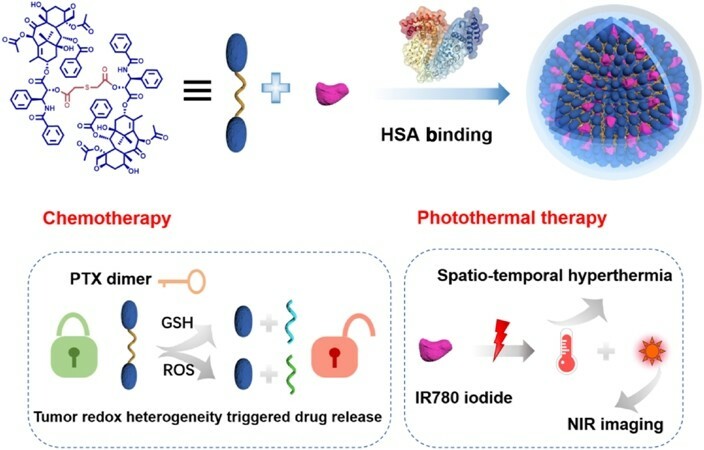 Meanwhile, PTX2-S facilitates the encapsulation of IR780 iodide due to their π-π stacking interaction and IR780 iodide generates spatio-temporal hyperthermia under light irradiation to kill cancer cells for photothermal therapy. 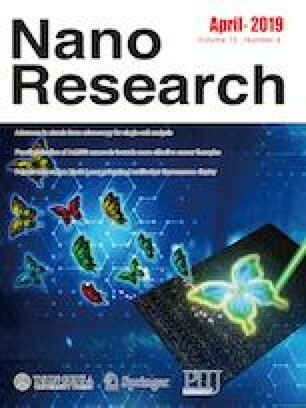 The described craft integrates the biomimetic trait of HSA, high drug loading, tumor redox heterogeneity-initiated on-demand drug release, and combination therapy into one formulation and the developed nanoparticles are promising for cancer treatment. Supplementary material (physicochemical characterization, Table S1 and Figs. S1–S18) is available in the online version of this article at https://doi.org/10.1007/s12274-019-2318-7. This work was supported by the National Natural Science Foundation of China (Nos. 51773197 and 51522307).